Tim LaRocco offers his thoughts on Hurricane Sandy from Cambodia — a land also impacted by natural disaster. Phnom Penh— I grew up in a town called Lindenhurst, a relatively quiet suburb on Long Island’s southern shore located just inside Suffolk County’s border with Nassau. It’s an upper-middle class, family-oriented neighborhood whose residents, for the most part, have all of their needs and wants met. When I was a boy, my mother would take my brother and I down to the beach at Venetian Shores where we would go rollerblading and build sandcastles against a backdrop of sailboats bobbing up and down peacefully on the Great South Bay. That peace was shattered last month when Superstorm Sandy devoured the town, leaving behind a trail of damage and destruction that Lindenhurst hadn’t seen since Hurricane Gloria smacked the area in 1985. 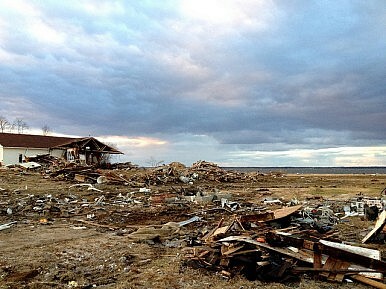 But even the results of that terrible storm might pale in comparison to the scenes of devastation left in Sandy’s wake. Dozens were killed, millions of people across the east coast lost power, and fuel shortages became one of the primary effects of the storm. The long queues at Long Island gas stations have reminded some of the 1973 oil crisis. Over the hours and days that followed, I observed the moods of those who had rode out the storm through my various social media feeds. It seemed to shift from immediate relief, to growing frustration, to, eventually, hardened anger. Many gas stations were closed; those that were open had lines that extended for blocks, even during the early hours of the morning. In one notable incident, when one man complained after Sean Bailey, 35, cut in front of motorists waiting in line at a gas station, Bailey proceeded to pull out a pistol and threaten his accuser with it. This event prompted police to send patrols at all gas stations throughout the area. The cost of the damage will be in the billions. Now, while reconstruction will take long-lasting effort, the reality is that most things for most people returned to normalcy within a matter of days and weeks after the storm. The power came back on, and people began to rebuild their lives with the assistance of insurance claims, FEMA aid, or, short of that, charitable donations from nonprofits and individuals alike. Generosity is one of America’s best traits. I did not personally experience Sandy’s wrath. I was in Cambodia, a country that is not immune to torrential rainstorms and flooding. It is a raw and untamed land with a past as dark and tragic as anywhere in the world. It is a country rife with the type of poverty that most Americans can only read about in newspapers and magazines. On the day the storm struck New York, I was in the Cambodian province of Kratie, a rural outpost filled with humid, dense jungle and fog covered mountains which conjure up feelings of memories of Martin Sheen traversing the fictional Nung River in Apocalypse Now. I was visiting the family of a friend of mine in his “hometown.” Most Cambodians living in Phnom Penh have a hometown in a province somewhere outside the capital. There’s no running water here and electricity is sporadic. There are no gas guzzling automobiles, nor is there wifi or smart phones. When I showed my Samsung Galaxy to some of the young children in the village, they looked at it with bemusement and amazement. There is no toilet paper; not even a sprayer. After using the squatter to go to the bathroom, you can clean yourself up using a communal sponge ball and a bucket of water from the river. Such poor sanitation has led to outbreaks of typhoid. In November 2011, a particularly strong monsoon season left large parts of Southeast Asia devastated from the Philippines to Thailand. Nearly three quarters of Cambodia’s land mass was affected. Some people lost everything. For them, there were no insurance claims. There was no government agency coming to their assistance. The rescue effort had to be spearheaded by local charities and NGOs. Reconstruction has been difficult, especially when factoring in strongman Prime Minister Hun Sen’s proclivity to sell land to international corporations. The villagers are provided little to no compensation for their troubles, and evictees don’t have much say in the matter. Without diminishing the tragedy that was Sandy, it should give Americans pause and allow them to reflect on the material things in life that all in the West sometimes take for granted. In the end, electricity will be restored, gas tanks will be refilled, and homes will be rebuilt. But let’s not lose sight of the fact that Americans can count themselves lucky in this respect. For many people in the developing world, existing without the aforementioned comforts isn’t just a temporary inconvenience after a historic natural disaster; it’s a way of life. China's Cambodian HegemonyThe Life and Near Death of Sam RainsyUncertainty and Pressure: Cambodia Under the Weight of SanctionsCambodia’s Democracy and EU Trade Privileges: Taking a Long-Term ViewIs Cambodia’s Foreign Policy Heading in the Right Direction?